Some projects have a complete Architectural Schematics and only require the sourcing, selection & coordination of finish materials and window coverings. Using our design library, we will select materials that fit within your design aesthetic, budget needs, and timeline. This package is limited to 1 kitchen, 2 baths, 1 mantle, and generalized materials for living rooms. Price above includes 5% G.S.T. Meet by video conference at the beginning of your purchase in order to ensure that you have a clear understanding of the steps and information we require. Provide up to 3 Concept Mood Boards for you to select from with a final concept solution (4th option) to suit your needs within 2 weeks of purchase. 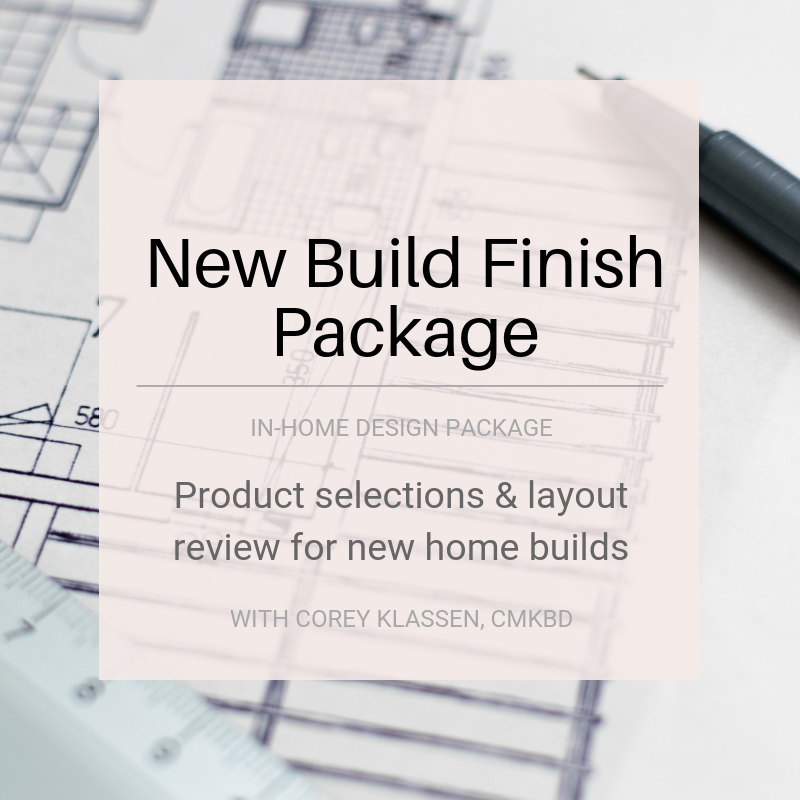 Produce a completed finish package with specifications within 30 days of purchase. For local Clients, we may provide you with a detailed estimates of cabinetry and counters with installation costs, hardware, dining furnishings, lighting fixtures, and window coverings. Any design fees paid are credited toward your cabinetry purchase price. Book your First Video Appointment as soon as possible to ensure you receive the time-slot that works fo for you but please note that if you Questionnaire isn't received 24 hours before your meeting, it will be canceled it and you will need to rebook. Be prepared for a discussion and to receive questions. For the best efficiency, commit to be being distraction free during our video conferences and take your own notes. Your Second Video Appointment can be booked in advance with 2 weeks between each. Your final payment of $2,362.50 (incl. 5% G.S.T.) will be made upon completion of the Second Video Appointment and by this time any necessary revisions or changes will have been fully addressed. Within the next 2 weeks your package is complete and ready to print!